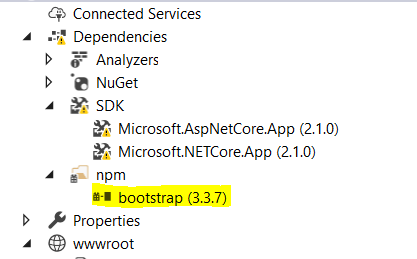 Right click on Visual Studio Add > NewItem and select NPM configuration files and add to the project. 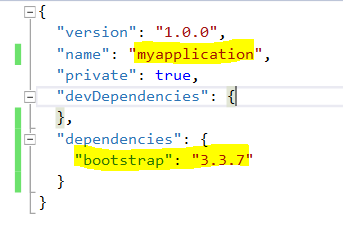 Step 2 : Update the package.json with required dependencies for application. Make sure name should be lowercase without space. 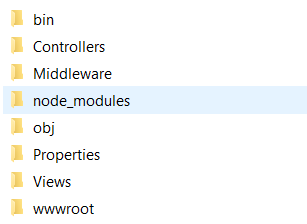 Once you save the package.json , you can see the npm package in project dependencies and also node modules are downloaded in to the project directory.You can include the node_modules folder in to your VS Project by clicking show all files and include in to the project. When you set a RequestPath , static files Middleware only try to respond to request starts with node_modules. FileProvider is where does it goes to FileSystem to look for the file. Note : Please make sure the namespaces for extension method and startup.cs class are same. This is the approach that Microsoft uses to resolve the extension method for IApplicationBuilder to ensure method is more diiscoverable. What is WebHost builder in ASP.NET Core? A WebHost builder is an object , which is responsible for setting up the web server environment.These settings are completely customizable by writing our own builder. By default Web host builder is using Kestrel web server, which is a cross platform web server supported by .NET Core. This Webserver will listen all the http request connections. Also This builder set ups IIS integration. If your application are running under IIS , it is the integration that allows IIS to pass through Windows Credentials to the Kestrel server.